She started with graffiti at the age of 12. The very people debating her work had perhaps rubbed shoulders with the artist in earlier days: she performed in a Zentai suit in the metro, trying on guises. In 2006, when she was 17 (according to her) she had it: disguise perfected and marker in hand, Princess Hijab sprang from the shadows. She says her mind was filled with a combination of fashion, gender and societal change; visions of both the French Revolution and France’s struggling minorities. She tells The Independent that at first she’d wait around to see the reaction, a habit she’s since abandoned, but the rush remains. The targets, she says, were carefully chosen — claimed. Princess Hijab knows that L’Oréal and Dark&Lovely have been killing her little by little. She feels that the veil is no longer that white. She feels contaminated. When she was a teen, she heard about movements such as Adbuster; but since 9/11, things have changed. She does not subvert images in an American way. Princess Hijab will go on, veiled and alone, forever asserting her physical and mental integrity. By day, she wears a white veil, symbol of purity. By night, her black veil is the expression of her vengeful fight for a cause (custom ad). With her spray paint and black marker pen, she is out to hijabize advertising. Even Kate Moss is targeted. She knows all about visual terrorism! And she will not spare her right of expression for the likes of publicists. She calls her work “a survival strategy in urban settings.” The Metro is the densest subway system in the world, after all, and Paris’ underground, from catacombs to hidden temples, has a history of hidden deeds stretching back to ancient times. “Paris is a fantastic city, loaded with mysteries and full of history,” she says. That defiance — her insistence that her art is its own reality — hasn’t wavered. She has consistently refused to answer questions about her position on the burqa ban, and I don’t have any better luck. “My work is not linked to any event but more to my personal approach,” she emphasizes. In this way, Princess Hijab represents the latest iteration of something quite Western, she told the Independent that she’s inspired by “a certain French Romanticism”: the mysterious artist, continuing with their work, leaving others to place it in context, refusing to involve themselves in the cut-and-thrust of contentious politics, on no side. An impossible vision, perhaps, but it remains powerful for a reason. Much is made of the modern world allowing people, especially immigrants to its bustling metropoli, to redefine themselves through a mix of talent, fantasy and ego. In same ways Princess Hijab is simply taking the promise at its word, and playing it to the hilt. For all Princess Hijab’s repeated assertions that she, and only she, defines her work, the hijab and niqab remain explosive issues in her home, and elsewhere. Last year, authorities fined a French woman after she attacked an Emirati tourist, ripping her veil off. Two other French women, meanwhile, dubbed themselves the “Niqabitches” and combined the head covering with heels and mini-skirts to highlight the absurdity of the ban. As the prohibition went into effect in April, French police arrested protesters. As the tension over the hijab has risen, Princess Hijab has seen increased media focus. The attention has its downside, too, she claims, taking up the refrain of artists throughout the ages, that some media simply seek to fit her into a category, articles “deviate towards viewpoints that are too far off or even are a caricature” of her work. Over-the-top? Yes, but that’s part of the point of a persona. In her own way, Princess Hijab seems to send the age-old message that nothing in any culture, from any part of the globe, is off-limits from art. Even in the heat of controversy, her ribaldly covered figures declare, there’s room for enigma and charade. My sincere thanks to Vanessa Page-Ngambi for her translation assistance with this piece. Sorry, my mistake. For once, Wikipedia trumps dictionary.com. Mea Culpa. David C — that really threw me for a loop, too. Even after reading the wikipedia page, I have no idea how it makes sense in this context. I really liked this article, despite feeling, too, “thrown in a loop”, as previous commenter wrote. 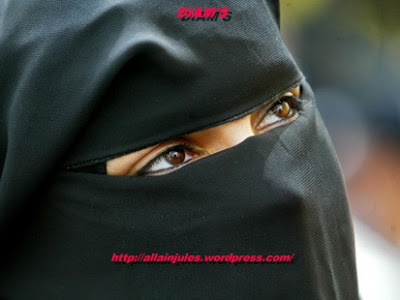 I tend to get very confused about the muslim veil issues, I can’t settled my mind about it.